This is Mitchell. He lives with his mama, Jessica, from Mad in Crafts. Jessica is a really good friend and she’s taught me a lot. Jess was a high school English teacher. Before meeting her, everything I knew about English I had learned in my shorthand class. It’s really handy having a blogger friend who also used to teach English, believe me. Total aside: I realize there’s a fairly good chance that some of you have never heard of shorthand. Which is fine. If you’ve never heard of shorthand, I probably don’t know the names of any of the songs you listen to either. 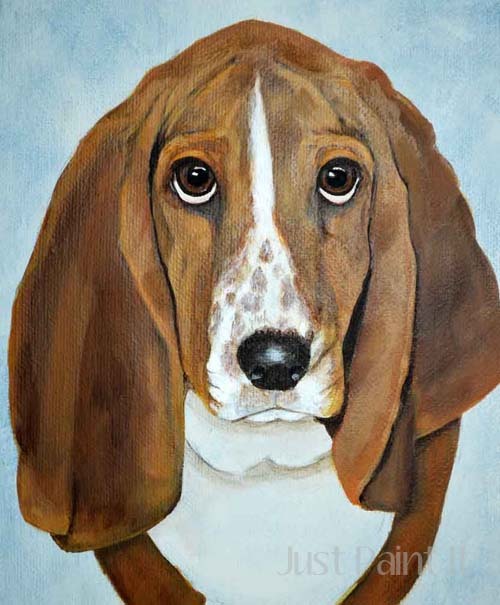 But none of that has anything to do with painting dogs now, does it? Ah, painting . . . the bridge to generational differences. Where was I? Oh yes, Jessica. Well, it turns out that her dog had things to teach me too. Not necessarily life-changing things, like those books, “Umpteen Things My Dog Taught Me” or whatever. No, Mitchell taught me things about painting and drawing. 1. I take too long painting backgrounds. For real. It’s a background, people. Mix some colors – or don’t – and slap it on there, let it dry, and move on. Life’s too short to worry about the background which will hardly be noticed anyway. 2. 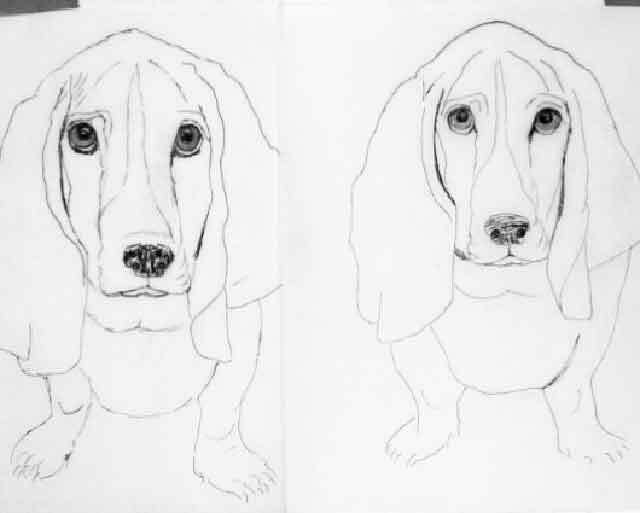 I draw eyes too far apart and noses too long. This is nothing new to me, actually. But c’mon . . . if you know you do something, why not stop doing it? You know what the definition of insanity is, right? Doing something the same way over and over and expecting different results! What?!? This simply can’t be true! 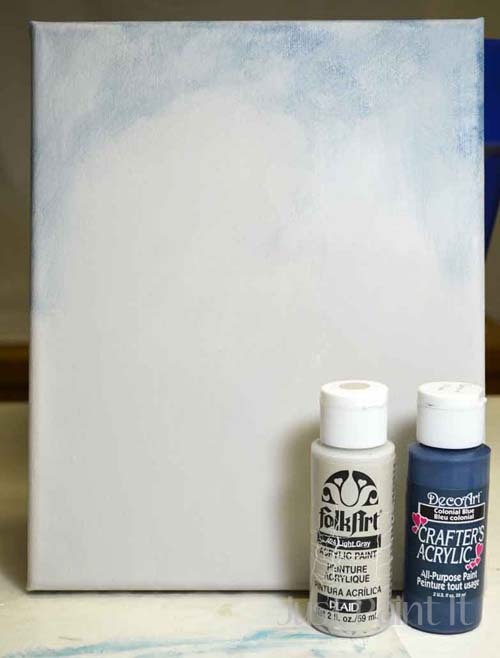 I’ve used craft acrylics for almost 20 years! I’ve used craft acrylics for wall murals, for furniture, for nearly anything and everything I’ve painted. I know all of Ceramcoat’s colors by heart and nearly all of FolkArt’s. I don’t have to mix colors, I just grab a bottle, pour and paint! How could craft acrylics possibly take longer than tubes? Because a) it takes 3-4 coats to get good coverage with liquid acrylics and b) you still have to mix colors to get the right shades – like on Mitchell’s ears, for example. 4. It’s time to grow up and start using tube acrylics. I’ve been afraid to use tube paints because I’ll have to mix my own colors. But since I’ve been using watercolors, I’ve been mixing shades and it’s actually one of my favorite parts of painting now. It’s time to use tube acrylics so I can work, not only faster, but better on each piece. 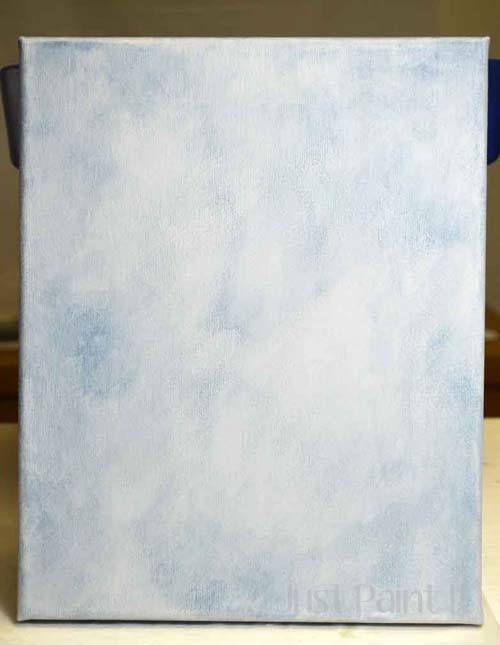 Oh, I’ll still use craft acrylics for teaching because I do love the layering qualities of the liquids. But for portraits, I’m putting on my big girl pants. I take photos all the way from beginning to end, and yet, I haven’t placed them side by side until Mitchell. As soon as I did, of course, I noticed all kinds of discrepancies which would’ve been caught if I’d done a comparison earlier in the process. 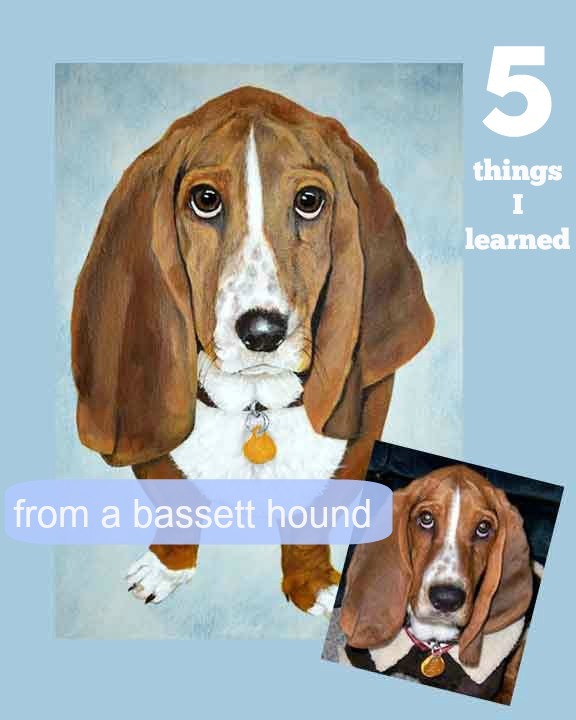 Who knew you could learn so much from a bassett hound? And while I thought I’d only learned things about painting and drawing, it turns out that Mitchell’s advice really was life-changing. 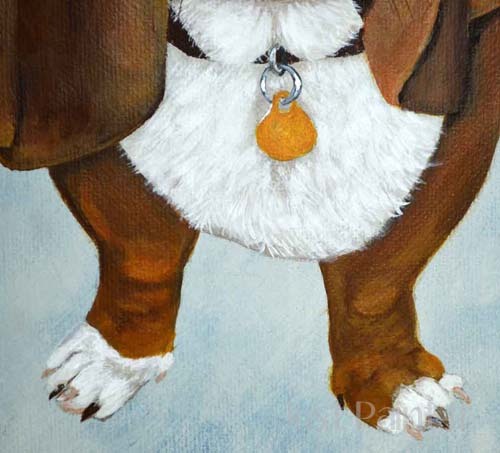 I mean, I’ve started using these 5 tips in a bulldog portrait I’m painting and I can’t tell you how happy they’ve made me. What about you? What new things have you learned lately? Whether it’s about painting or anything else. Learning is learning! 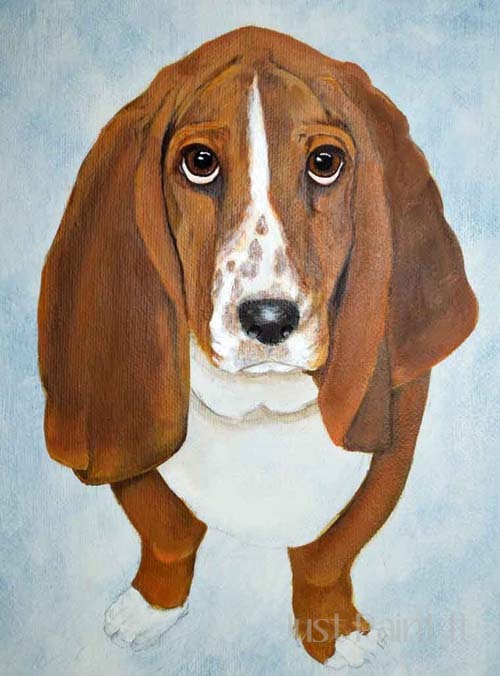 Beautiful portrait of Mitchell Colleen & love your blog so glad I found you !!! Oh, Lyn, I love Newfoundlands! Of course, I love all dogs but newfies are something else. I’d love to see your painting. Do you have a website or Facebook page? I’m so glad you found me too! I love ‘talking’ to other creatives, whether they paint or not. I almost spit out my tea when I burst out laughing from your shorthand comment!!! I’m right there with you, Colleen! 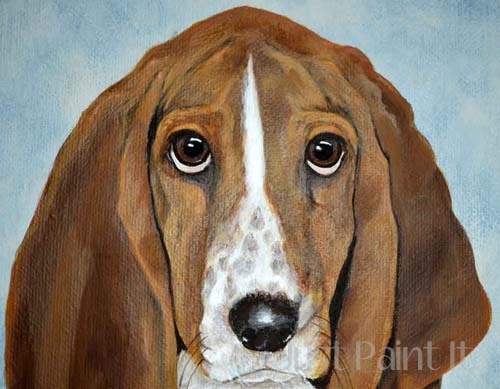 I come here, not only for your artistry and great tips, but your sense of humor is right on the money!!! Keep smiling and I will, too! Aw, thanks Kris. Sometimes I wonder about my ‘humor’ and if it’s too much. I’m glad you got it! It’s still a shock to realize that I’m now a senior citizen in many eyes, haha. I still feel like I’m in my 30’s most of the time! But then I have no idea who these singers and actors are. lol. Keep on keeping it real, Colleen! Can’t wait to see if there will be any visual differences in your portraits. I know you will master those tubes and have all the colors memorized in no time. What brand will you be using? That’s a whole other Blog post, I’m sure! Have beautiful day!! Hey Laura! Well, I was gonna wait until I’d saved some money to buy a nice supply of tubes but I was digging around this weekend and found some! Ha ha. Go figure. I don’t even know how hold they are or when I bought them, which is scary. But they’re just fine! They’re Grumbacher, btw. I’m using them on this bulldog I’m painting and there is a HUGE difference! I’m so happy with them. At least, so far! 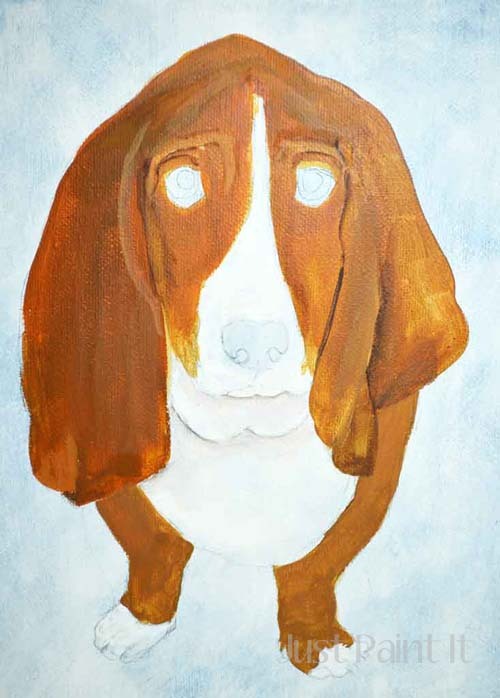 Colleen, I am amazed at your painting of my granddog, Mitchell. 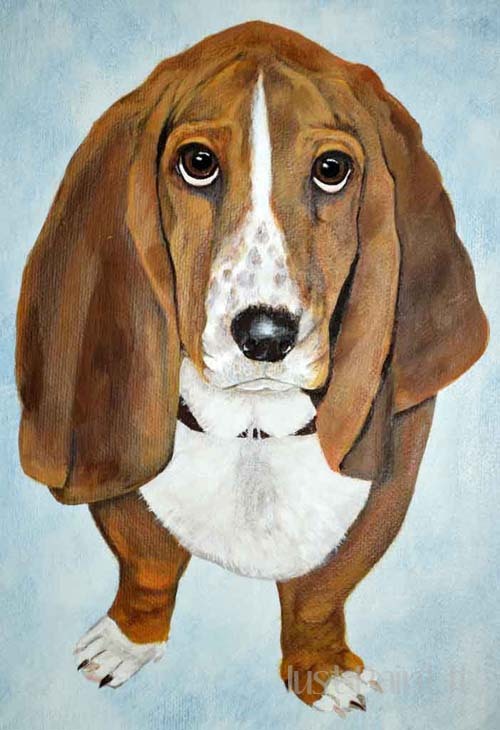 It is like I could reach right into your painting and play with those beautiful droopy velvety ears of his. 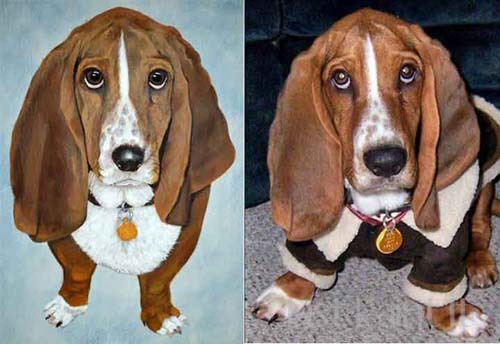 I am in awe of your painting talents! P.S. I’ve learned things from Mitchell as well. 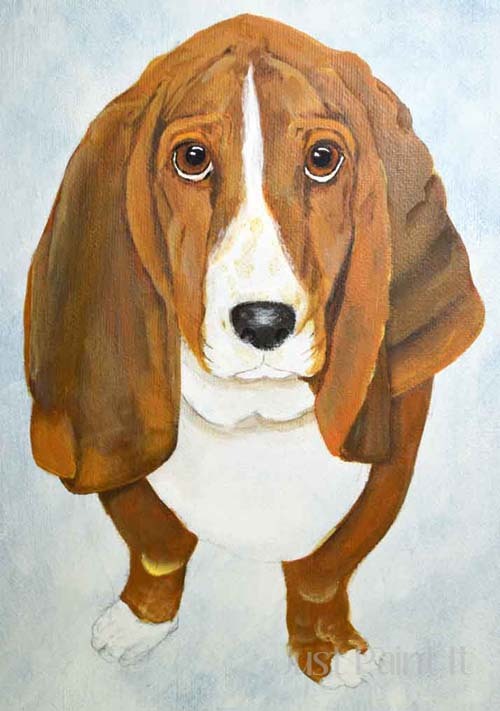 I learned if you let a basset hound sit on your lap in a chair when he is sad because his regular family is away on vacation, he will assume that your lap is the place to be every time you visit him, no matter what. He’s a rather large lap dog, but a pretty sweet puppy, even at eight years old. How sweet of you to leave a comment, Barb! Thanks so much. I was so happy to paint Mitchell for Jess. She’s been a dear, dear friend to me so this was special. I don’t think I could refuse him my lap either, ha ha. What a cutie! Thanks again! 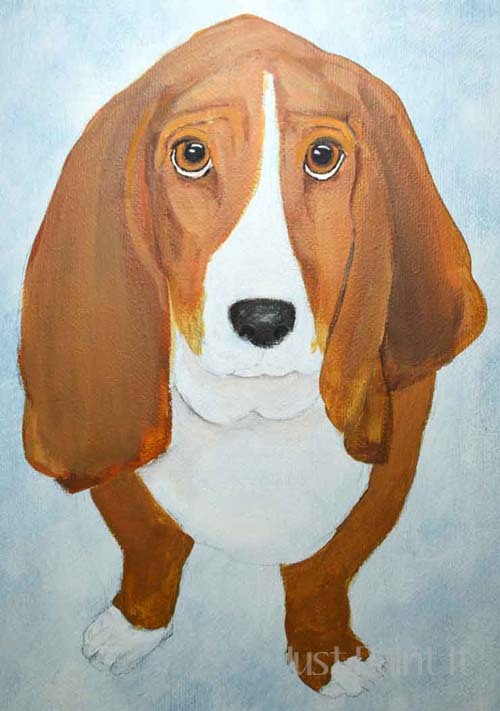 Will you please post your bulldog painting when you finish? I just lost my bulldog last Wednesday and I regret that I never painted her. I just bought a cement Bulldog from Lowes that I am going to paint to look like her. Oh Jan, I’m so, so sorry. Losing a pet is unbelievably painful and hard. 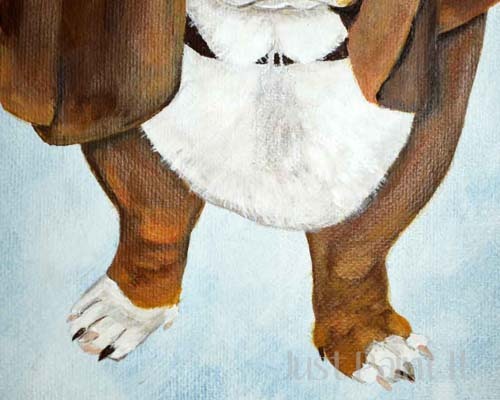 Of course I’ll post the bulldog I’m painting. It should be up in a few days. Do you have any pictures of your baby? I always paint from photos. Perhaps you can do the same? Although I’m sure the cement one will be lovely. 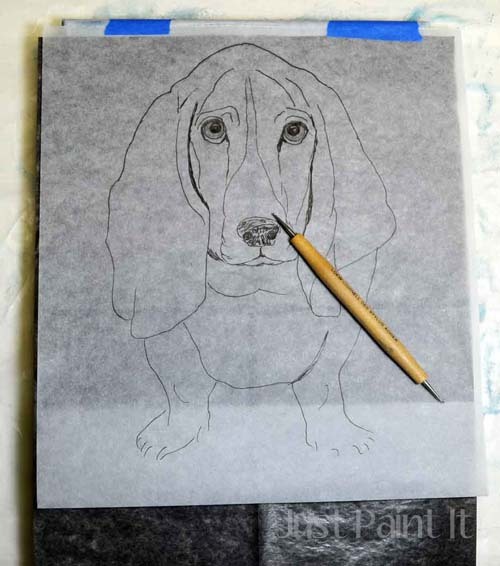 This dog is so beautiful – and your ideas are so awesome – now I must write some words to you. and I feel we are kindred spirits. longer as 3-4 years with the same colour…. have not a minute without creating new plans, have shelves and cabinets full of accessories. But I’m working in own company in office, many days more as 16 hours…..
To read about your person and thousands projects always with a smile and so much humor…is sooooo inspiring…. I think I should spend now more time with my hobbies. Thank you so much for the kick in my as..(pssst…). God bless you. I would be very pleased to read more from your ideas and spirit and humor. Since many years my live motto taken of John Lennon – is: Life is what happens to you / While you’re busy making other plans.